7 total results were found for this item. Ordered by high price to low price. 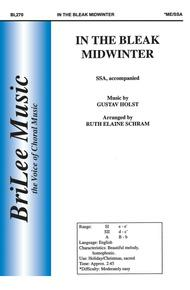 In the Bleak Midwinter composed by Gustav Holst (1874-1934). Arranged by John Leavitt. For Strings, String Orchestra (Score & Parts). Music for String Orchestra. Grade 3-4. Published by Hal Leonard (HL.4490607).A haunting, elegant carol is beautifully rendered by John Leavitt in this compelling setting for strings. Holst's classic Christmas piece makes a memorable centerpiece for a holiday program and one you'll want to perform year after year. Dur: 3:15. 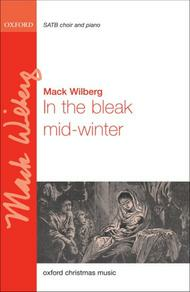 In the bleak mid-winter composed by Mack Wilberg (1955-). 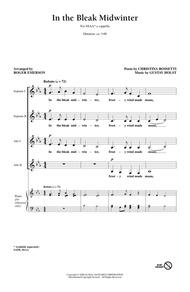 For SATB choir and keyboard/orchestra (2 flutes (optional), c, a, - horn - harp - strings,). Mixed Voices. Christmas, Choral Leaflet. Vocal score. 8 pages. Duration 6'. Published by Oxford University Press (OU.9780193376526).ISBN 9780193376526. Christmas, Choral Leaflet. 10 x 7 inches.for SATB and keyboard or orchestra This is a reflective and beautiful arrangement of the classic Christmas carol by Holst. Wilberg underpins the well-loved melody with luscious, romantic harmonies, including moments of exquisite chromaticism. 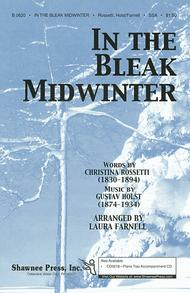 In the Bleak Midwinter arranged by Laura Farnell. For Choral (SSA). Shawnee Press. 12 pages. Shawnee Press #B0620. Published by Shawnee Press (HL.35010756).This famous text is beautifully set to music by Texas music educator and composer Laura Farnell. 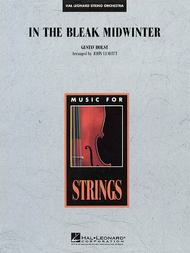 The long, lush phrases of In the Bleak Midwinter help teach breathing and dynamics while the tempo and legato style allows time to focus on vowels and tone, both within unison and multi-part setting. Repetition of parts make the dissonances easy to learn. The text has been adapted to keep religious aspects as general as possible for school performances. Full piano accompaniment tracks available separately on Piano Trax 2004 (CD0218). 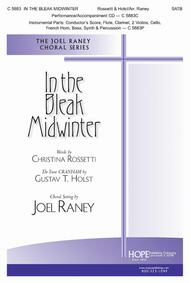 In the Bleak Midwinter arranged by Joel Raney. For SATB choir. Christmas. Octavo. 12 pages. Published by Hope Publishing Company (HP.C5883).A Celtic lilt flavors this Joel Raney setting of Christina Rossetti and Gustav Holst's beloved Advent/Christmas carol. A quote of "Still, Still, Still" makes an appearance before returning to the song's timeless closing, "What can I give him? Give him my heart." This arrangement first appeared in Joel's top-selling Christmas musical, Let the Whole World Sing (#8541). Instrumental parts consists of Conductor's Score, Flute, Clarinet, 2 Violins, Cello, Trumpet, French Horn, Bass, Synth & Percussion. 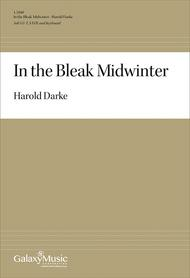 In the Bleak Midwinter composed by Harold Darke. For soprano and tenor soli, SATB choir and keyboard. Choral. Octavo. 6 pages. Published by Galaxy Music Corporation (EC.1.5160). In the Bleak Midwinter composed by Gustav Holst (1874-1934). Arranged by Ruth Elaine Schram. For SSA Choir. Choral octavo. Standard notation. Duration 3:36. Published by BriLee Music (CF.BL270).With Standard notation. In The Bleak Midwinter by Gustav Holst. Arranged by Roger Emerson. SSA. Concert; Winter. Choral. 7 pages. Duration 3:00. Published by Hal Leonard - Digital Sheet Music (HX.254579).About Digital Print Sheet MusicDigital Print is printable sheet music available anytime, anywhere. Just purchase, print and play! View your online sheet music at home, school, work or anywhere you have a computer connected to the Internet. Use our iPad app to view your digital sheet music on the go. With Digital Print, you can print your digital sheet music immediately after purchase, or wait until its convenient. And our software installation is easy - we'll guide you through the simple steps to make sure you have Adobe Flash Player, Adobe AIR and the Sheet Music Plus AIR application.